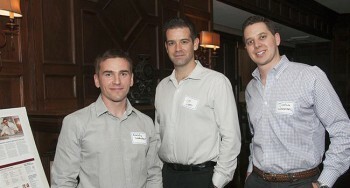 Residents work together to promote learning as colleagues. 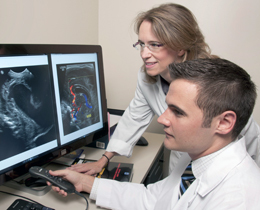 The UMKC School of Medicine radiology residency has an innovative detailed and well-organized curriculum that guides residents through the process of obtaining medical knowledge needed to become an outstanding clinical radiologist in private or academic practice. 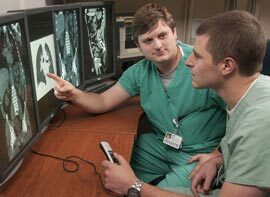 We take great pride in the fact that residents rotate through ALL areas of radiology with 12 electives. This includes those that are sometimes less accessible to resident training, such as cardiovascular imaging, OB.GYN and neuroradiology (neuro IR). Additionally, the core curriculum includes dedicated teaching in important topics including basic research methods, business and financial management, personal/professional development and general competency. Also included is a milestone-based dictation/reporting curriculum. 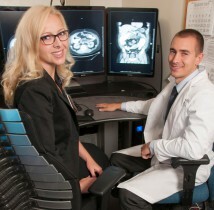 Resident Education Center – In 2014, a new radiology education facility was opened. Located in the Department of Radiology at Saint Luke’s Hospital, the center includes a resident lounge, kitchen, call room with shower/bath and a 50-seat conference room, Scarpellino Hall. The conference room includes Apple TV and state-of-the-art web conferencing capabilities. Resident’s hang out in the resident lounge. Stat Dx and RadPrimer – UMKC provides Stat Dx and RadPrimer to Radiology Residents free of charge for all five years of training. Daily 7:30am conferences– The core curriculum is covered at 7:30am by subspecialty, fellowship trained faculty, and repeats biannually. Dr. Chin, one of UMKC’s Amirsys books authors, teaches Neuroimaging. 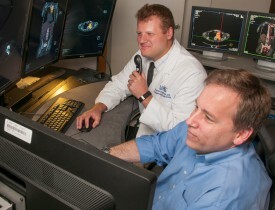 UMKC radiology residency hosts a daily interdisciplinary or web conference at 12 p.m. Monday – Friday allowing residents to attend conference on site or via web from any location. All sights have microphone and speaker capability, allowing the conference to be interactive from remote locations. 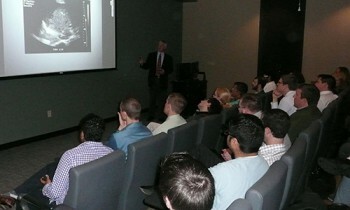 Audience response system – The Department of Radiology at UMKC owns its own audience response system, which is used during conferences. The ARS conferences tend to be interactive, increasing the fun everyone. Physics course – In addition to core physics conferences (two/month), UMKC residents have a free week off to attend a week-long physics review course during their PGY2 and 4 years. Although the review is attended by residents from across the United States, only UMKC residents attend free of charge, including daily meals. The course curriculum strictly follows the AAPM (American Association of Physics in Medicine), APDR (Association of Program Directors in Radiology) curricula and the RSNA physics modules. Practice questions are provided. Research travel and publication awards – At UMKC, we appreciate residents being productive in their scholarly work. Those residents presenting their work at national meetings are given additional time off and financial support by UMKC and Saint Luke’s Hospital Foundation. Residents who publish a manuscript receive a financial stipend to support educational activities. Resident buddy system – Each incoming PGY1 resident who matches at UMKC has a resident buddy in the PGY2 or PGY3 year. 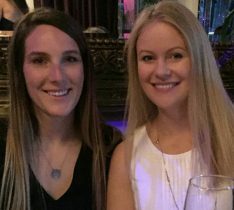 Resident buddies help with advice on making the transition from medical school to residency, including information about Kansas City in general, and UMKC in particular. ACE mentoring program – We are proud that each UMKC resident chooses an ACE (Accessible, Confidential and Encouraging) faculty mentor in the first 8-15 months of residency training. Mentors provide professional support such as advice on fellowships and help with personal issues or other needs. ACE mentors are basically “there for their mentees” when needed. 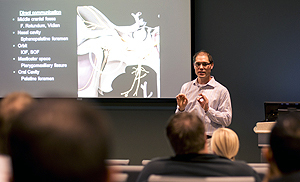 Visiting professors –Because learning from a variety of attendings from different backgrounds is very beneficial to broadening resident knowledge, UMKC has invested in one of the most robust visiting professor programs in the country. We average 18-24 VPs annually, including the most sought-after educators in the country. Free teaching files on DVD/CD ROM – Although less often used today due to numerous teaching files available online, UMKC continues to own and use the American College of Radiology teaching files on CD ROM, which are available at Saint Luke’s Hospital, Truman Medical Center and Children’s Mercy Hospital. Various DVDs for other courses are available for review as well. Core texts and review courses on DVD – Extensive access to core text books and other educational CDs and DVDs are available through the radiology libraries at each institution. These libraries are updated annually. Free introductory radiology books – All residents are given a free core Radiology text and physics book. Society memberships – Each resident becomes a member of the RSNA, ACR and ARRS free of charge, thus receiving their journals. Easy access to major radiology journals allows for ample journal club material. UMKC faculty work alongside residents encouraging them to take on increasing levels of responsibility as they progress through training. Free Kansas City Radiological membership – This membership is paid by the residency on behalf of each resident. This allows residents to attend four outside events with visiting professors from across the country. Journal access – Computer-based access to current medical journals is available at both the UMKC-SOM library and the Saint Luke’s Hospital medical library. Instructions on how to access journals are included in the resident manual. 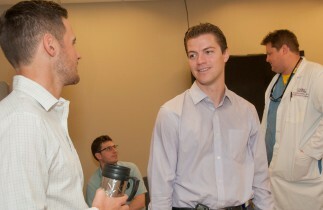 Fellowship placement mentoring and preparation – UMKC residents are able to achieve highly competitive fellowships for two reasons. First, each resident receives individual preparation and advice more than a year in advance on the fellowship application process. Second, because previous residents have done such a great job in various fellowships around the country, our current residents have a leg up. 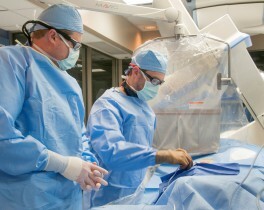 Residents perform all types of IR at Truman Medical Center (basic), Saint Luke’s Hospital (neuro IR & tertiary referral), Children’s Mercy Hospital (pediatric IR) and the VA (angiography). Residents are assigned to monthly rotations in various sub-specialty sections staffed by fellowship-trained faculty members. Each rotation follows specific goals and objectives for each level of training. Rotations include exposure to: nuclear medicine, pediatrics, musculoskeletal, thoracic, breast imaging, neuroradiology (including neurointerventional), abdominal imaging, sonography (including obstetrics and vascular), emergency(call)radiology, and vascular/interventional. Residents progress through a core curriculum with the number of months suggested by ACGME. 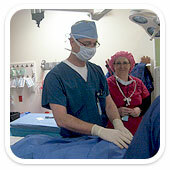 Faculty physicians supervise residents during clinical working hours, with increasing responsibilities appointed to the residents over time, commensurate to level of training. The expected course is that resident’s progress from initial observation to eventual full competency in image interpretation, dictation and performance of image-guided procedures. Electives – Residents have 12 electives to focus on an area of interest or research. Most residents accumlate 8-12 months in their area of interest prior to graduation. 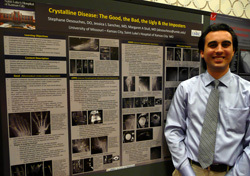 American Institute of Radiological Pathology (AIRP) – To reinforce correlation of diagnostic imaging findings with pathology and physiology, each resident attends a four-week course in Bethesda, MD during the PGY3 (R2) year prior to the core exam. The course registration fee is paid by the program and a stipend to cover living expenses is provided. Call coverage is an integral part of the educational experience as residents learn to function more independently. Residents participate in night float emergency radiology (ER) after demonstrating satisfactory competence during their first year of radiology training. All studies are interpreted by a staff radiologist. Teleradiology access to the homes of attending physicians is readily available in order to assist residents with difficult cases after hours as needed. Evening and weekend image interpretation is performed by on-call residents with all images reviewed by staff radiologists. Residents undergo formative core competency-based evaluations at the completion of each rotation. Confidential peer, program and faculty evaluations are performed, as well. Resident comments are used for internal program improvements. Residents meet with the program director biannually. Exams – UMKC pays for residents to take a yearly in-service exam provided by the American College of Radiology (ACR). This exam provides UMKC residents with an opportunity to compare individual sub-specialty subject knowledge by level of training to peers at other programs. These scores can help determine strengths and weaknesses to focus study efforts. Residents must pass USMLE part 3 and/or COMLEX part 3 by the end of the PGY2 year. However, UMKC will pay the cost of the exam if taken during the PGY1 year. UMKC is proud of the extensive award winning research produced by the department from residents, faculty and fellows in recent years. Residents interested in research will find UMKC is supportive with time off, preparation and finances related to research. Although each resident is required to do only one scholarly project (as per ACGME guidelines), our residents are encouraged to pursue as many as they wish. Research electives may be taken for up to a month/year. Those presenting may take up to one extra week off per year and receive a stipend to attend an additional meeting. Free statistical support and pre-project research planning are available through UMKC as well. 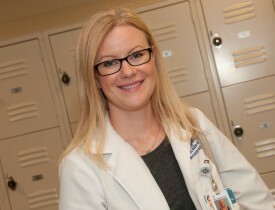 Few fellows in the department and a collegial work environment allows residents to reach their full potential. 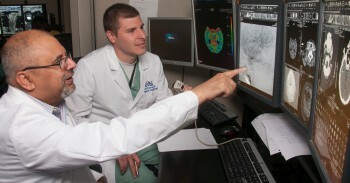 The UMKC School of Medicine and the radiology residency are both fully accredited by the Accreditation Council of Graduate Medical Education. During our last site visit, the diagnostic radiology residency program received five years accreditation, the longest possible cycle, and was accredited “with commendation,” a very rare honor. Because of our good standing with the ACGME, we are able to have the innovative integrated clinical year program. The program fulfills requirements to prepare residents for specialty certification by the American Board of Radiology and complies with guidelines recommended by the American College of Radiology and the American Board of Radiology.